The absence of TNF-α does not alter the kinetics or magnitude of LCMV-induced autoimmune diabetes in RIP-GP or P14/RIP-GP animals. (A) RIP-GP mice were infected with LCMV Arm. Blood glucose levels were measured at multiple time points and used as an indication of islet β cell autoimmune destruction. Blood glucose levels of 1 mouse representative of at least 6 mice are shown for each genotype. (B) P14/RIP-GP animals were infected with LCMV Arm, and blood glucose was monitored as in A. Blood glucose levels of 1 mouse representative of at least 5 mice are shown for each genotype. 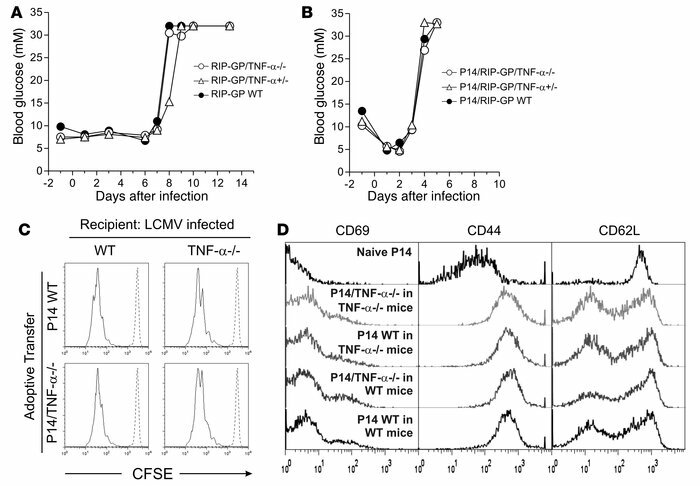 (C) CFSE-labeled P14 WT or TNF-α–/– CD8+ T cells were adoptively transferred into WT or TNF-α–/– mice infected 3 days previously with LCMV Arm. The extent of T cell proliferation was assessed by CFSE dilution in spleens 3 days later (solid lines). Histograms are gated on CFSE+CD8+Vα2+ cells and are representative of 3 independent animals per condition. Dashed lines indicate the CFSE profile of undivided cells. (D) Expression of CD69, CD44, and CD62L on CFSE+CD8+Vα2+ cells from C.